Today, proceed to Jamnagar. On arrival visit Lakhota Lake &Lakhota Museum. In the evening, visit Bala Hanuman Temple known for its nonstop Ramdhun since 1956 and it mentioned in Guinness Book of World Records. Evening is free for Shopping. Overnight stay at the hotel. 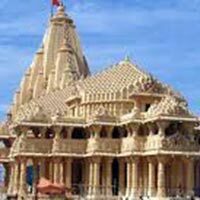 Today, proceed to the sacred town of Dwarka Major Tourist arrives for Dwarka Tourism.Visit Dwarkadeesh Temple. Take a holy dip in Gomti river,later leave to visit NageshwarJyotirling, GopiTalav, Bet Dwarka, and on way back do visit Rukmani Temple, evening visit other temples on coastal area, attend evening aarti at Dwarkadish temple. Overnight stay at the hotel. After breakfast Proceed to Sasangir. Sasangir, is the home of the Asiatic Lion. Visit Gir Interpretation Zone at Devaliya (During Rain sanctuary will be closed) Later proceed to Junagadh. The ancient city has many eye catching monuments which reminds its great history. Later visit Uperkot Fort, Ashok Rock Edict, Mahabat Makabara and Junagadh Museum. Overnight stay at the hotel.